This is a Modestination Proclamation and a roadmap for the future. Oh yeah, pretty epic quote right? Branding is a very simple process. What is a brand? Why do we do it? What does it mean? It is quite simple really. Branding is taking the thing that is your soul, your culture, your authenticity and your reason for being and why you are what you are. Think about it, a brand is not a slogan or a should rephrase, it is the essence of your company, community or your culture. There have been a lot of brand and product failures like “new Coke” or the Edsel and we have had some of those have been here in Modesto. From the ill-fated slogans in days past like “No one’s got Modesto’s goat” to the recent “Family Owned and Operated” none have really addressed what a brand really is and how it can benefit our civic pride, our community, our travel and tourism and our core sense of being. How can our brand elevate us and make us proud? Let’s start with the basics; who are we? We are a fantastic agricultural community that plays a big role in feeding the world. Very cool huh? Yep, but there are many communities in California that can claim that honor. We are home of big wine. Yes also true, we are proud of Gallo, but Napa, Manteca, Ripon, Lodi, Sonoma, Paso Robles and others share wine credibility too. Farm to fork locavore food? Nice, but Napa and Sacramento and recently Stockton are staking that one out and have cool places like the Oxbow Market. Wait, how about the “Home of American Graffiti”? Bingo. There is only one Modesto that George Lucas made his breakthrough movie about. Now we are getting somewhere. What do we say we are? We are the city with many amenities that has small town values. Yes, that is a classic Graffiti 50s feeling. Concerts in the park with MoBand? That is a classic community feeling and unique to Modesto and the town square of the mid-century. The legendary Gene Winfield, one of first custom classic car creators started his work in Modesto, building and creating these beauties in his chicken coop and later in his show at 451 Tully. This is real. What about 10th and 11th Streets in downtown Modesto? These are the streets where Modesto cruised and that inspired George Lucas to make a movie about this rite of passage “mating ritual”. That slappin’ bass sound in the opening frames of American Graffiti of Rock Around the Clock? Straight from Modesto, California 1938. 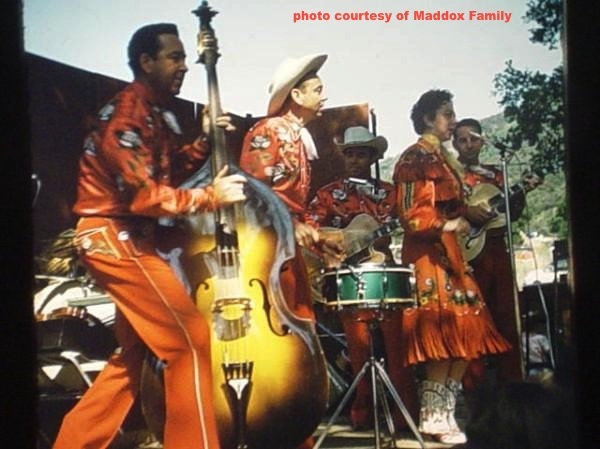 The string slappin’ sound that Fred Maddox of the Maddox Brothers and Rose, created on his big stand up bass, were the beats that put the “rock” in Rock n’ Roll broadcast to the world on our own KTRB radio. All of these roots run right here to our very own Modesto USA. 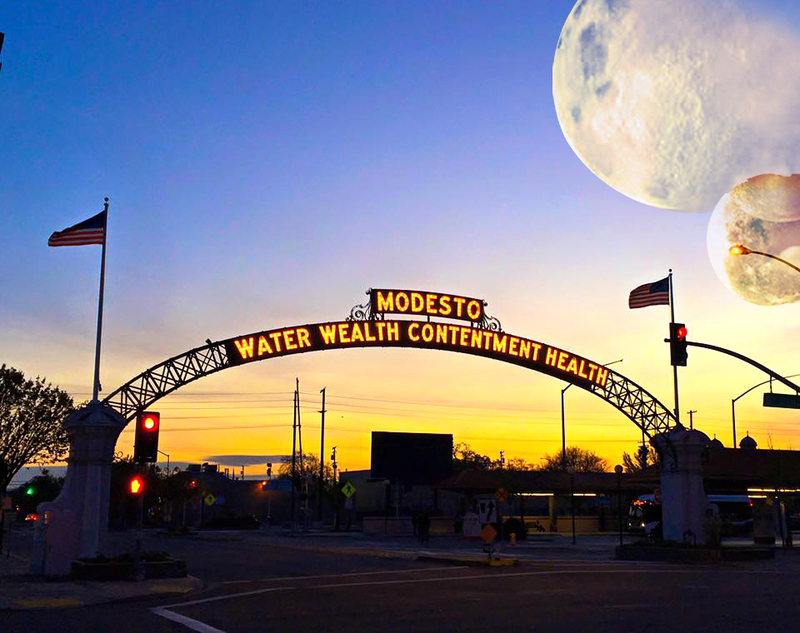 Yes, friends, there may be other Modestos in the world, but there is only one Modesto USA, A Classic American City. We are the birthplace of Rockabilly, the home of American Graffiti and the birthplace of the largest winery in the world. Modesto is the place where classic candy-apple cars were created and cruised and all of this was captured and wrapped up in celluloid by our very own George Lucas and promoted around the world. 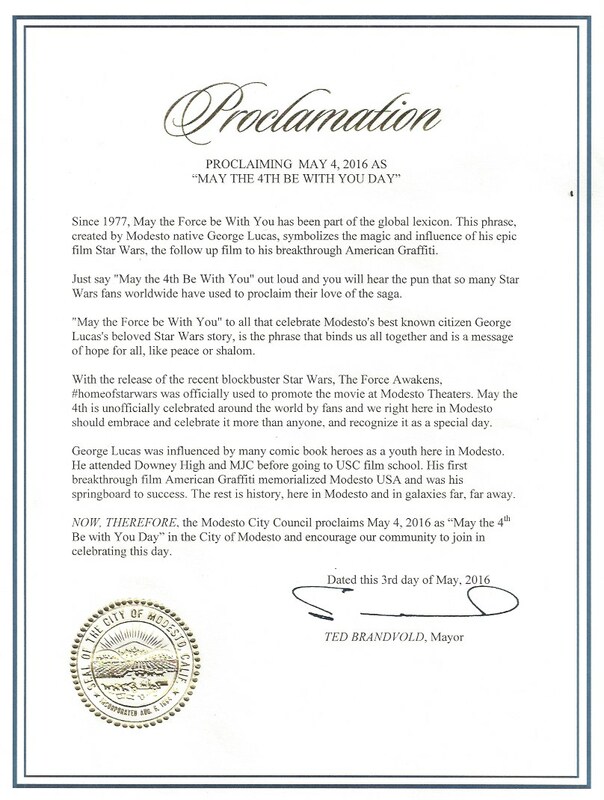 Those opening scenes of a young Luke Skywalker trying to escape the planet Tatooine and do something bigger are the stories that were created right here in Modesto. So yes friends, we are the #homeofstarwars and the small town feeling that gave us Gallo Wines, the Cruise, Rockabilly, American Graffiti, Star Wars and the produce that feeds the world is who we are. Modesto’s Royal Robbins will forever be part of the global climbing elite that conquered the majestic granite walls of nearby Yosemite. These are our stories. Whew. Are you exhausted yet? This doesn’t mean that we all have to drive ’57 Chevys and grease up our hair. It means that our city has a sense of purpose, a real history that many cities would love to have. So many cities try hard to create something that sets them apart to attract visitors. We already have this and we need to let these flags fly. The future of American Graffiti might be the Cars and Coffee project that draws thousands of car buffs into downtown Modesto with all sorts of cars, from exotic imports to the newest muscle cars. The Modesto Impalas engage our Latino community and their love of cars. Even if you don’t drive a car, or even care about owning a classic, these cars are art, and these shows are an art show. There is something for everyone and Modesto’s car culture is evolving. Do the millennials appreciate authentic history? Absolutely yes, which is why every new bar in metro areas looks like an 1890 factory with hand crafted cocktails, vinyl records, 70s graphics, hand makeries like ModShop, and food origin locavore eating is so popular. It is all about authenticity and where things come from and how it connects you to the experience. It gives us a sense of place and it makes us feel good. The cities that we celebrate, like Asheville NC, succeeded by rebuilding their historic core and celebrating their authenticity. The coolest place in Las Vegas is now the Vintage Vegas neighborhoods that are attracting the younger creatives. 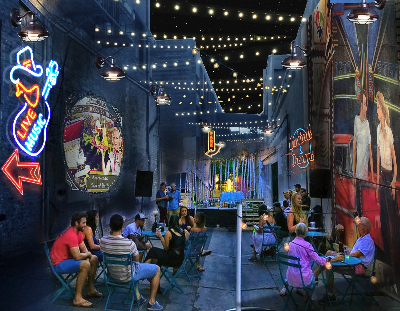 http://fremonteast.com/ Downtown Modesto has this possibility. So blend our George Lucas history with our car history and our American Graffiti history, our Rockabilly history and our claim as the “Home of Star Wars”, and you have a very special recipe for future success with a rock solid retro foundation that can spring us into the future. Think about it, one of the best marketing minds ever was Walt Disney. Now, who created something that has, over the last few years, consumed Disney and Disneyland? Yes, friends, it is George Lucas, of Modesto USA, who unleashed Star Wars on an unsuspecting world in 1977 that now has become the most valuable part of the Disney empire. Yes friends, be proud that our community was the source of so many culture changing things. This should make every Modestan feel proud and special. 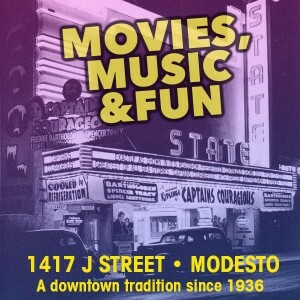 We are Modesto USA, A Classic American City. Branding is authenticity, and it is the soul of who we are. So let’s take our place behind the wheel and be the city that we can be and celebrate who we are. This is what makes a “Top 10” city. We can do it, so let’s go! Let’s fly our flag and be what we can be.